30 3⁄4 (33 1⁄4, 36 3⁄4, 40, 43 1⁄4, 46, 49 1⁄4, 52 3⁄4, 56)"
This easy-to-work cardigan’s textured stitches and waist-buttoned style are design elements that will flatter many different body shapes. 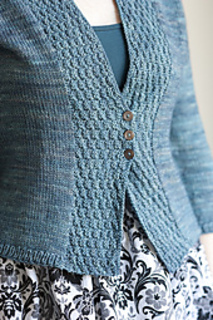 The simplicity of stockinette lets the rest of this cardigan show off a beautifully dyed yarn. Finished Measurements: 30 3⁄4 (33 1⁄4, 36 3⁄4, 40, 43 1⁄4, 46, 49 1⁄4, 52 3⁄4, 56)“ bust circumference. Shown in size 33 1⁄4” with 1 3⁄4” of negative ease. Approx 1050 (1100, 1180, 1270, 1380, 1430, 1520, 1650, 1740) yds.